Sitting by the rink at a Flyers game is always a blast. But this time brought a new element to the experience – sitting at the end of the rink where the Flyers warm up before the game. My husband I got to our seats an hour before game time to find a group of girls (perhaps I should call them young ladies) in Flyers jerseys standing by the glass. They were chattering about the Flyers and holding pink, heart-shaped signs that said “stud” on one side and “heartbreaker” on the other. My first thought was, wow that’s gutsy (and a bit silly). And my second thought was, wow, this warm-up should be interesting. As soon as the Flyers hit the ice, the girls started holding up the signs as different players skated by. None of Flyers seemed to take notice until a Flyers defenseman, during a stretching session, looked over his shoulder at the girls and gave them a huge grin. Then, a few minutes later, he did it again. I wondered if the girls had any personal experience with the Flyers players, knowing full well that puck bunnies abound at all rinks. But I chose to assume that this player was just being sweet and showing appreciation for his fans. It is well known that the Flyers are aware of their status as professional athletes and use it well. They are known to frequently visit a children’s hospital in Philadelphia, and they are involved in various charity events and efforts. My point is: the Flyers are appreciative of their many fans, including the female ones. When I go to Flyers games (my husband and I have partial plan season tickets), I am pleased at the number of female fans that I see. And, when looking and listening to what goes on around me at the games, I am pleased to see and hear a lot of women who are very into the game and very knowledgeable about it. For example, sitting next to me at this particular game were a group of young ladies who were very knowledgeable about the game and very intense about every play. Hockey has always been mainly a man’s sport and an “ole boy’s network”. But I think things are slowly changing. The USA women’s hockey team just won the silver medal in the Winter Olympics. The NHL Network has an excellent female sportscaster who is knowledgeable about the game and seems well-respected. And, I assume that females are visible in NHL front offices (but I do not know that for sure). Ultimately, more female fans can only be good for the NHL and the sport in general. And, it takes all kinds of female fans who go to the games for different reasons. And, for this fan, a day sitting rink-side at a Flyers game is pretty high on the list of my favorite kind of day. I told myself it was an early 2013 Christmas present – even though it wasn’t even Thanksgiving yet. Anything to allow myself to tell the nice woman at the Guest Services counter at Wells Fargo Center “yes” to the two tickets on Row 2. And fortunately my husband knew better than to try to stop me. He just shook his head and dismissed any responsibility by telling the woman, “They’re her tickets anyway.” I justified the decision like this: it is a day-long outing coming from Northern Virginia to Philly, and a logistical challenge lining up three puppy sitters for our two mini-dachshund “fur babies.” We may as well make it worth our while. We bit the bullet at our first game as Philadelphia Flyers season ticket holders in October and paid the extra $100 per ticket to upgrade from our designated seats in the upper level of the arena to the same second-row seats my American Express card just committed us to this evening. And once you have a taste of the “on the glass” experience, no other seat in the arena will do. I have become a huge Flyers fan this season, living and breathing every game and every story posted on Philly.com. And it hasn’t been easy sometimes. The Flyers had a terrible start, going 0-3 in the first three games of the season, leading to the firing of their head coach. Things weren’t much better under new coach Craig Berube (aka Chief) at first as the team continued to flounder and ended up in the basement of an incredibly weak Metropolitan Division in the newly re-aligned NHL. But I had stuck with them believing that they could eventually put some good hockey together, even though I wondered, along with many others, if this team just didn’t have the talent and should be dismantled and put back together under a new general manager. I couldn’t believe that things had gotten this bad. By the time of the fight, the Philly arena was nearly empty, and my husband and I threw in the towel a few minutes later. But somehow the fight seemed to ignite something in the Flyers, and since then they have been on a roll. The truth is more likely that it took them several weeks to adjust to Chief’s new defense- and skating-centered system. But whatever the reason, it is working and the Flyers are winning, having won six of their last seven games while gathering points in all seven (one tie) in order to climb into the middle of the pack in their division. So here we were, a full hour before game time this November evening, mere feet from the glistening ice. After some player interviews and Flyers history videos played on the scoreboard, the cool rap/techno music started blaring and the teams hit the ice. Though my Flyers were at the other end of the rink, I could see them fairly well from my ice-level view. I knew for sure that the swagger was back when I saw team captain Claude Giroux laughing and shoulder bumping his teammates. Several weeks ago I remember watching him sternly shooting at the empty net during warm-ups—and missing. Giroux was in a slump almost more disappointing than the team’s as he went 20 game without scoring a goal. This from a gifted goal-scorer who graced the cover of the EA Sports NHL13 video game. He finally broke out of the slump during a defining victory at home against the Edmonton Oilers several weeks ago. I happily viewed that game from the club level with my visiting father, who as a Western North Carolina resident, was a “newbie” to the NHL experience. When G scored it felt as if the Flyers had won the Stanley Cup. Since then, he has been scoring and assisting more like the G we knew from previous seasons. The thrill of sitting on the glass at an NHL game is beyond description. The faceoffs are mere feet away, and the jarring checks into the plexiglass boom and shake the baricade, making you trust that it will stay in place. My two favorite things to pay attention to from this viewpoint are the skating and the player’s faces. The players’ eyes reflect an intense focus that is required to play this game and the instincts that tell the players where to go and what to do in a nano-second. When this game is described as the fastest game on earth it is no exaggeration. The turns, crossovers, one-foot glides, and backwards skating at top speeds without even looking behind amaze me. I remember that when I took ice skating lessons more than 10 years ago, it took me months to do one back crossover, and I remained somewhat terrified of falling every time I attempted one after that. Now, I wouldn’t even know how to start, which is why I have started over and recently began taking skating lessons again. I am improving but still struggle sometimes just getting around the rink. I realize that skating in your 40s is definitely more challenging than skating in your 30s. My balance is worse, my legs are not as strong, and the falls are harder (as is the getting back up part). As a result, several months ago during my first trip back to the rink in over 10 years, I wondered if I was crazy trying this sport again. It can be dangerous as falling is an almost certainty. And, I am living with kidney disease resulting from a rare auto-immune disease that I battled last year. But, exercise is a good thing and I love the feel of gliding over the ice, so I am keeping up my courage and continuing with the lessons. The hockey game progressed nicely and the Flyers looked so much better than they did earlier in the season. They were skating hard, forechecking, getting good shots on goal and suddenly they had a 3-0 lead. However, unlike games of old, the Flyers didn’t cave as the Islanders got within one goal. Instead, they picked up the pace and turned on the heat. Near the middle of the third period, Jake Voracek, a favorite of mine who was possibly benched in the previous game for not performing well, dug the puck out of the corner right in front of me and fed it to Brayden Schenn in front of the net for a goal that gave the Flyers some breathing room with a 4-2 lead. The Flyers hugged and celebrated the goal in front of me as I clapped and cheered as loudly as I could. A perfect finish to a perfect evening. Icing on the cake to another fun day centered around Flyers hockey. I felt blessed as my husband and I rushed out of the arena into the bitter cold for our drive back to Virginia. 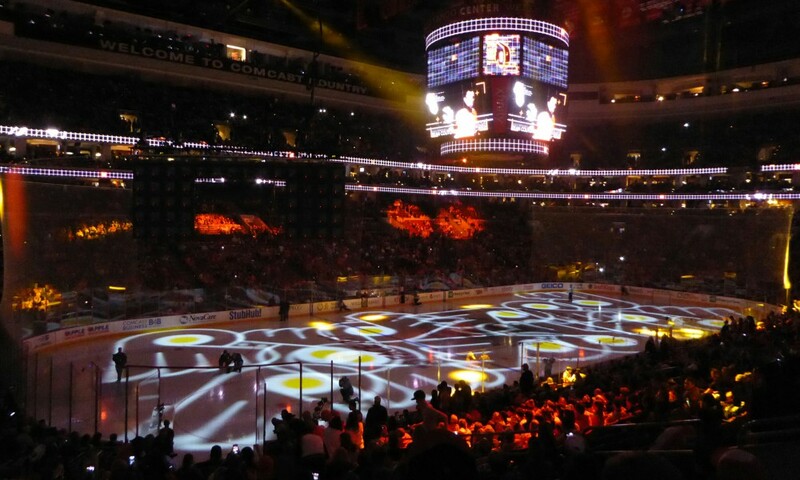 I bid the Wells Fargo Center goodbye – in appreciation for another great hockey game and with a bit of sadness knowing that I would have to wait over a month for another night of Flyers hockey.